HUTCHINSON, Minn. - It was all about bridging the gap between the Minnesota dairy industry and state organizations and lawmakers during a Dec. 6 tour hosted by Minnesota Milk Producers Association and Skyview Dairy near Hutchinson, Minn. With Minnesota Pollution Control Agency (MPCA) Commissioner Paul Aasen, MPCA Assistant Commissioner Rebecca Flood and Minnesota Department of Agriculture Assistant Commissioner Matt Wohlman present, among others, bridging the gap is exactly what happened. The tour began at 9 a.m. at Skyview Dairy, owned and operated by Daryl Luthens and sons, Garrett, Brandon, Shane and Justin. Following introductions, Garrett described the farms history - how it evolved from a six-cow dairy in 1968 to the 1,150-cow dairy it is today. "By the early '90s, we knew we were working toward a 1,200-cow dairy," Garrett said. The Luthens built their first freestall barn in 1994 and continued milking their 300-cow herd in their old barn with a double-9 herringbone parlor - the second parlor added to the facility. In 1998, they added a second barn, bringing the capacity up to 600 cows. Six years later, in 2004, they added on again, building a new double-20 parallel parlor and 360-stall freestall barn, which allowed for the farm's total of 1,150 cows. As they explained the farm's history, the Luthens also described some of the problems they went through to grow their operation. "[The permitting process] was tough," Daryl told Aasen and others in attendance. Part of the problem, they said, was that large dairies were a foreign concept in the area. "It was an unknown; no one knew what the final product would be," Daryl said. "We went in [to the county meetings] with a family attitude. There were a lot of long hours trying to get things done." Aasen agreed the permitting process can be hard to navigate through. "Neighbor relationships are huge, then there's local land use issues and there's us (MPCA). Those are three distinctly different pieces of the puzzle," Aasen said. From there, discussion covered a range of topics regarding the permitting and environmental review processes, and how some of the processes vary by county. "I think as dairy farmers it has been a big learning curve," said Greg Jans, Minnesota Milk member and Meeker County dairy farmer. "We didn't know we would have to be PR (public relations) people. We've had to learn that." To get a hands-on idea of what the Luthens went through to grow their business, the group took a tour of the dairy, stopping in the barns, at the calf hutches, the manure and run-off lagoons, feed storage area and milking parlor. Throughout, the Luthens explained the different aspects of the farm. The freestalls on Skyview Dairy have been bedded with separated manure solids since 2003. The dairy itself only uses around half of the separated solids produced in a year; for the other half, the Luthens are in a partnership with the city of Hutchinson. "We take the manure [solids] out to a field and compost it in windrows with stuff (leaves, sticks, etc.) from the city. It is then packaged up into 40-pound bags and sold back to citizens," Brandon said. By the calf hutches, Garrett described their calf-raising practices. Calves zero to six weeks of age are housed in individual hutches before moving to super hutches and then group pens. From four months old to breeding, the Luthens send the heifers to another facility, and once they are bred, they go to Justin's farm. As they looked at the calves, Garrett also described their crossbreeding program. "We do do some crossbreeding [with Jersey bulls], but we are 80 percent Holstein," he said. The lagoons were another point of interest. While one collects liquid waste from the dairy itself, a second lagoon - which was completed last month - was put in to catch runoff from the silage piles and super huts. It was a required investment by the Luthens, but one they don't expect to see many returns on. "The benefits don't always accrue with the people spending the money," Aasen said. 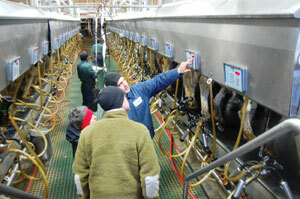 As the group walked through a second freestall barn and the milking parlor, they were able to see some of the regular happenings that occur on a dairy farm. They watched as the veterinarian preg-checked the herd and were able to see the detailed milking procedure up close as Garrett described the steps. Back in the dairy office, Minnesota Milk Executive Director Bob Lefebvre thanked the commissioner and others for attending, as well as the Luthens for hosting the event. 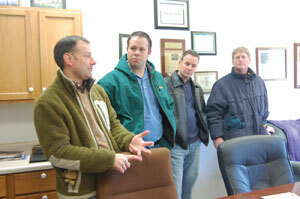 "We wanted, in part, to give you an understanding of what dairies [that want to grow] go through," Lefebvre said. "Ultimately, we are trying to build better relationships and are trying to find ways to make small improvements in the [permitting] process." Aasen, Flood and Wohlman took time to field discussion from those in attendance before departing. "Thank you for taking the time [to do this]," Aasen said. "We've gotten some ideas that we can work on ... We hope to come up with something that's not just a report that sits on the shelf." "We hope that as you have issues and concerns, [you come to] MMPA," said Minnesota Milk president, Pat Lunemann. "We are more than willing to help." "Just remember," said Jans, "Not too many dairy farmers wake up thinking, 'What can we do to pollute today?'"